With energy prices continuing to rise, managing day-to-day electricity costs is increasingly more important to home owners. The good news is, if you’re about to build a home, there are a number of options available to keep ongoing electricity costs to a minimum at your new place. 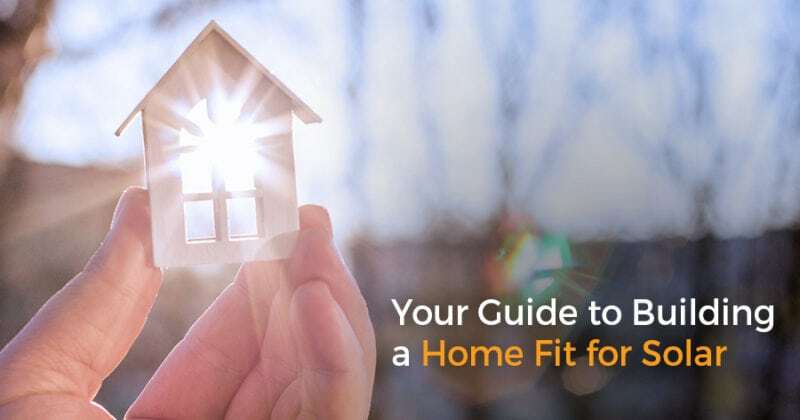 You may already know to look for energy efficient appliances, and your builder will often discuss your options for double glazed windows and gas heating, however this is also the perfect time to ensure your newly built home will be suitable for solar (either now, or in the future). Investing in a solar system is one of the most significant energy saving steps. It will not only provide you with protection from continually rising energy prices, but you’ll also experience an overall reduction on your electricity bills and an increase in the value of your home. And of course, installing solar power means you’re doing your bit for the environment too. Using the earth’s natural resources to power your home drastically reduces your carbon footprint. So what things should you consider when designing your humble abode to maximise your sunray harnessing abilities? Choosing the right block of land will greatly impact on how the sun falls on your panels. The ideal block will be flat with the sun moving left to right or right to left over the top of it, but if this isn’t the case choosing one with a hill on the western or eastern side will be the next best option. 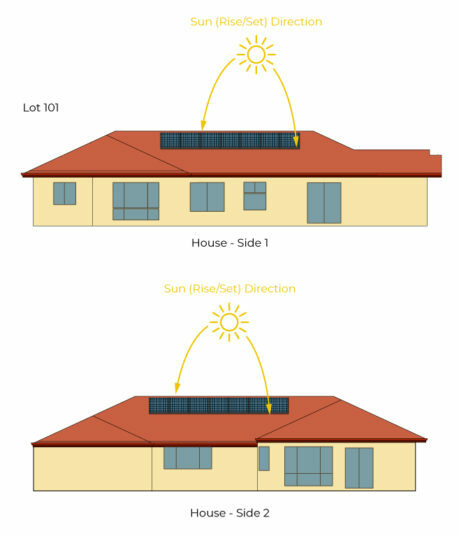 With the sun rising in the east and setting in the west, you can maximise the amount of solar power your system will generate by splitting the panels evenly (or close to) between the areas facing these directions so ideally, you want to sufficient roof space to match these factors. The size of the available roof space can also limit the size of the system you’re able to install if the required number of panels don’t all fit. As a rough guide, panels measure 1.7m x 1m each and you need to fit about 20 panels for a 6kW system. It's also important to consider if you will expand your system in the future, as this will require additional roof space. You may only need a 4kW system today, however, if your circumstances change later down the track (like a growing family or installing air-conditioning), or you want to purchase a battery for energy storage, you may find you need a larger system, and ultimately this will require more roof space. Roof pitch also needs to be considered. Generally speaking, a roof angled at between 15-35 degrees is ideal for solar panels, whereas a flat roof will require an additional tilt frame to angle the panels correctly. The below examples illustrate how the size of your system can vary depending on the block orientation and design of your home. Home Design 2 is considered the most ideal roof space to allow for a bigger system, however if you are unable to accommodate these at your home you may need to install a smaller system. The conditions listed below mean the largest solar system that can be installed at this home is 3kW, with no room to expand their system in future. 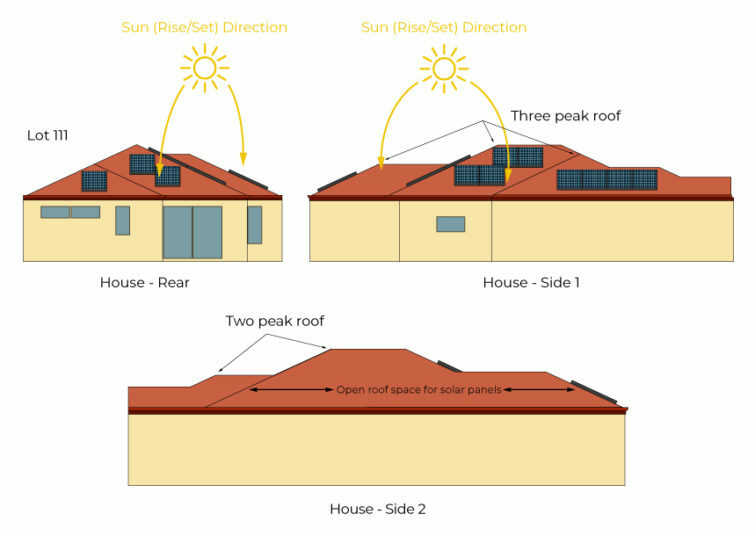 Due to the orientation of the block in relation to the direction in which the sun rises and sets, the rear roof and roof side 1 receive the most exposure to the sun. However the rear roof contains 3 roof peaks, meaning panels have to be positioned separately in smaller groups, reducing efficiency. Open roof space on side 2 will not be exposed to enough sun to warrant putting any additional panels here, however had the homeowner flipped the layout of their home before construction, a larger system could have been accommodated. The conditions below mean this home is ideal for energy production and allow for more solar panels to be added in the future to increase the size of the system. Block orientation is ideal, with plenty of roof space facing the direction of the sun moving from one side of the house to the other through the day. Minimal roof peaks on side 1 and side 2 provide sufficient open space for panels to be arranged in line with one another, which helps with efficiency. Ample roof space with adequate sun exposure to both sides still remains, so the home's 4kW solar system can be expanded in future, allowing it to produce more energy to charge a solar battery and offset even more of the home's electricity costs. To save yourself the hassle later down the track, we recommend having your solar pre-wiring completed before the walls are gyprocked. Your builder’s electrician will be able to pre-install a conduit and make accommodations for the connection of a future solar PV. Ensure that you have as much unobstructed roof space as possible to guarantee optimum surface area is being hit by the sun. Nearby objects such as trees and neighbouring houses can case shade over your roof and decrease your solar system output. Similarly, the position of antennas, roof vents and even air-conditioning systems should be considered. We recommend keeping these off your north, east and west facing roof faces, with south facing being the best option. Having these services kept to the south facing roof ensures a smarter roof design to accommodate for common solar arrays and future proofing for bigger systems when batteries become viable. If your only option is to place these on your north, east or west faces, we recommend positioning them to the edge of the roof space to maximise room in the middle of the roof facet for panels. It’s important you receive correct, up-to-date industry knowledge. 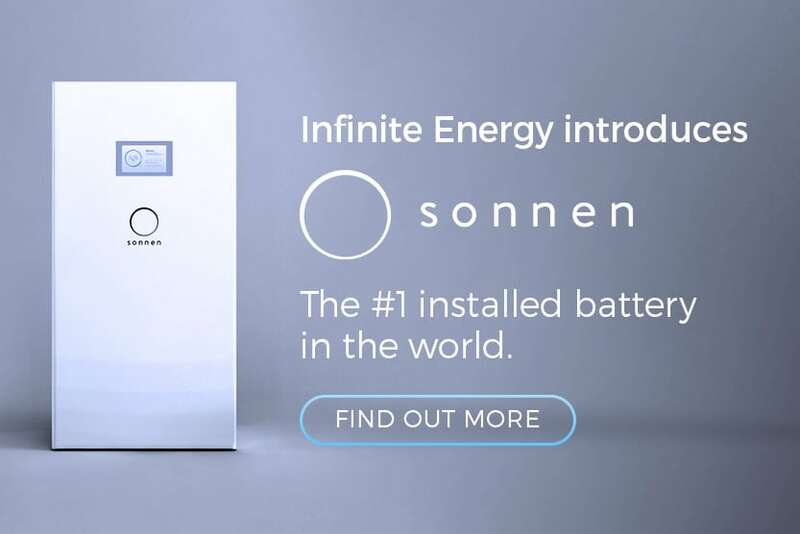 Our experienced team at Infinite Energy will provide you with all the information you need to ensure your home is solar-power ready and can even co-ordinate with your builder to have your system installed during construction. To find out how solar could work for you, please call us on 1300 074 669 or request a call back for a free, no obligation assessment with one of our energy consultants.